Crystal Palace will look to offload club-record signing Christian Benteke this summer with the Belgian having scored only twice this season. Palace manager Roy Hodgson has grown frustrated with the struggling striker, who was signed from Liverpool in 2016 in a deal worth £27million rising to £32m. The 27-year-old is on steep wages of around £120,000 per week at Selhurst Park and Palace, in line to avoid relegation, are ready to listen to offers. 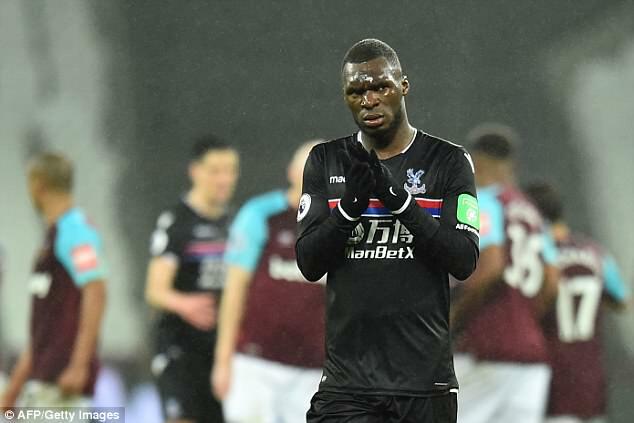 Palace know they will likely take a hit on their original investment but Hodgson has not hidden his disappointment with Benteke in recent weeks. The 70-year-old used Wilfried Zaha and Andros Townsend up front in their 3-2 win over Brighton at the weekend and dropped Benteke to the bench. The week before, after seeing Zaha and Townsend work well together in their 2-2 draw at Bournemouth, Hodgson said: ‘That’s the best we’ve played going forward for a long time. Palace will also look to keep Zaha at Palace this summer, though will be tested by the Premier League’s bigger clubs after the winger’s fine season.